Today, we are pleased to launch a new monthly feature titled “Voices for Equality.” Each month, we will highlight the crucial contributions of human rights defenders to the global human rights movement by profiling an activist working on behalf of equality for all. Human Rights First will share these profiles with U.S. government leaders and lawmakers and use social media to amplify the important voices working on the ground and to encourage U.S. action to protect and promote the rights of LGBT people worldwide. Syinat Sultanalieva describes herself as a “Lesbian, Gay, Bisexual, Transgender, Intersex, and Queer activist from Kyrgyzstan” and she has already had a profound impact on the advancement of the human rights of LGBT people in Central Asia. Working for the LGBTIQA organization Labrys, she has advocated for the Kyrgyz LGBT community since 2007, raising awareness of the persecution and discrimination LGBT people face. 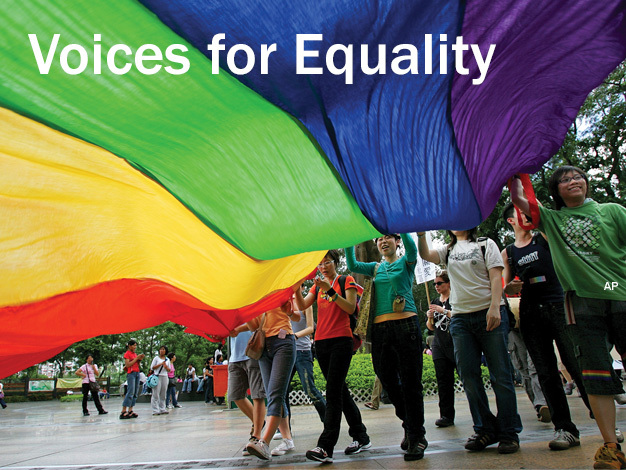 Syinat has prepared numerous reports on the situation of LGBT people in Kyrgyzstan for various United Nations treaty bodies, including the Committee on the Elimination of Discrimination against Women, the Universal Periodic Review, and the International Covenant on Civil and Political Rights. Last year, Human Rights First expressed concern over news that Kyrgyzstan’s parliament had begun debate on a discriminatory propaganda law. The bill, which would emulate Russia’s infamous law banning “propaganda of nontraditional sexual relations to minors,” allows for more severe penalties, including the possibility of jail time. Additionally, the law would be broader, penalizing all speech and expression that portrays neutral or positive views of lesbian, gay, bisexual and transgender relationships, not just those expressed to minors. To become law, the bill must be approved on three readings in total and be signed by Kyrgyz President Almazbek Atrambayev. One reading has already occurred. Recently, the European Parliament also took up the fight, calling on Kyrgyzstan to withdraw the draft law and work to “reaffirm publicly that all people in Kyrgyzstan have the right to live free from discrimination and violence based on their sexual orientation and gender identity." The United States and other countries recently raised the subject of the law in the Universal Periodic Review process, calling on Kyrgyz officials to refrain from adopting any legislation that limits the fundamental rights to freedom of expression, association, and assembly. Speak directly to the Kyrgyzstan government about the negative impact a propaganda law would have on the U.S. – Kyrgyzstan bilateral relationship. Work with NGOs on the ground, as well as supportive political leadership in the country, on a country strategy to prevent this law from moving forward and to discourage the introduction of other legislation that would impact the rights of the LGBT community. Communicate with and support groups such as Labrys who are the most effective voices for change in their country, including through material support. Partner with the Council of Europe to promote its use of leverage, particularly given Kyrgyzstan’s status as a “Partner in Democracy,” to move Kyrgyzstan towards compliance with agreed upon commitments to respect human rights and fundamental freedoms, including for LGBT people. Create a Special Envoy for the Human Rights of LGBT People in the State Department to coordinate continued U.S. leadership on the global stage, including in Kyrgyzstan.